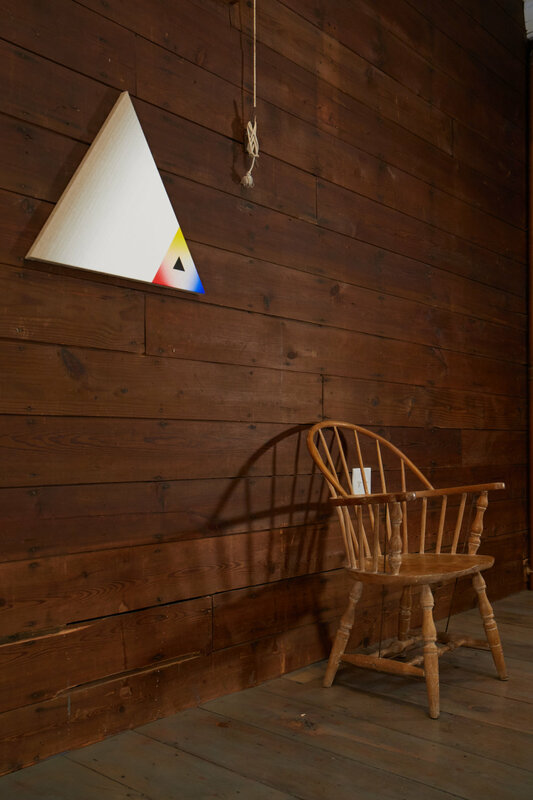 JDJ presents two new paintings by Brooklyn-based artist Adam Henry in the cottage and the loft of The Ice House. Henry’s shaped paintings are made with thin layers of white gesso and a limited palette of primary colors, applied to the surface of the canvas in such a manner that creates a mind-bending effect on our consciousness. Like the French artists in the Supports/Surfaces movement of the late 1960s, Henry is interested in how the practice of painting can be a model for critical thinking about the larger world, and how theories of abstraction and opticality can be related to the current political moment. Henry’s painting practice, while connected to color theory and systems of perception, also reinforces the more universal need to question what we see--an increasingly vital activity as post-truth politics have become a dominant global force. The two-part rectangular painting Untitled (Sd2e3), 2019, feels at first glance like a convex shape due to the gradation of yellow and white paint on the surface of the canvas. Each canvas has a slightly different depth, and the sculptural quality of the work becomes more apparent when viewed from the side. In Untitled (ApJo2A), 2019, Henry paints thin layers of gesso along the left edge of the triangular canvas, a way of marking time as well as exposing what is typically the underlying structure of the painting process. 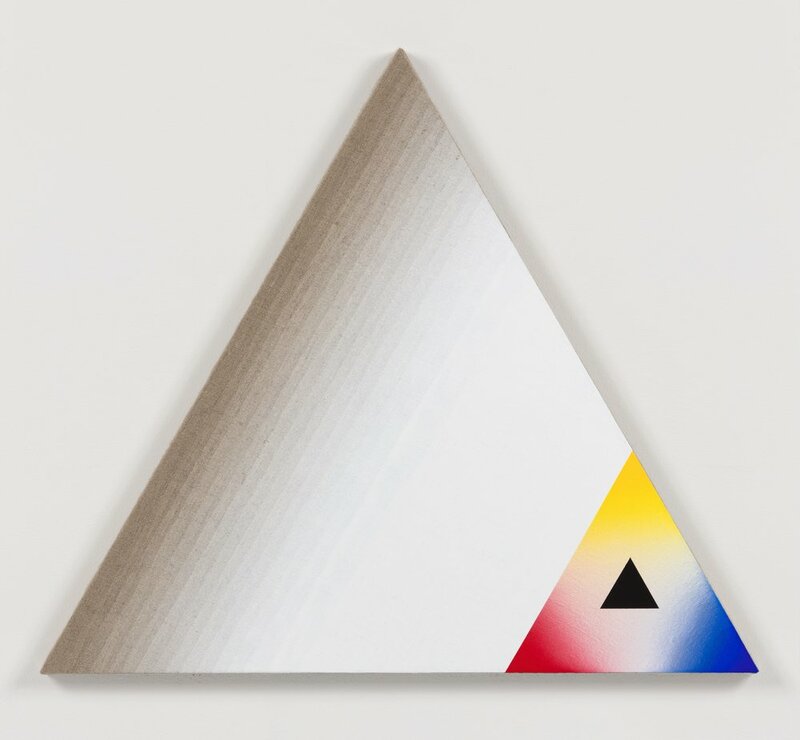 On the lower right corner of the painting, a small red, yellow and blue triangle inset with a chromatic black triangle in its center, creates a sense of flatness in opposition to the spatial effect of the gesso layers. Adam Henry (b. Pueblo, CO) lives and works in Brooklyn, NY. He holds a BFA double Major in Art and Art History from University of New Mexico and a MFA from Yale School of Art. Recent exhibitions include solo shows at Meessen de Clercq, Brussels, the University of Wisconsin-Stout. and group shows at Josee Bienvenu, New York, Rita Urso, Milan, Dia Horia, Greece, and Bill Brady, Miami. A monograph on his work from 2011-2016 was also published by Meessen De Clercq. JDJ | The Ice House is a contemporary art program created by Jayne Drost Johnson that highlights artists who embody a range of artistic practices and sociopolitical perspectives. For more information and to schedule a visit, please contact jayne@jdj.world.